Season begins on Monday, August 13th, 2018. Soccer is a sport that requires a high level of physical fitness and skills training - you cannot just come to play the game! It is a game built on speed and agility. If you neglect the off season, you neglect the game. It takes 6-8 weeks of hard training to get you in peek physical condition to play the game. If you wait to begin your training until our season begins, your season is already over. Why? You will not truly be ready to play the game until the season is almost over. If you really want to be successful this coming season, you must begin preparing NOW! You must focus on all aspects of the game: technical development (ball skills), speed and agility, and conditioning to prepare for our upcoming season. Off season soccer training helps with physical recuperation and minimizes any loss in strength and conditioning you may have gained during prior sports seasons. You can do more work over the next few months than we could possibly ever do during the course of our two month season. During the off season you will have to work alone or in small groups. The key to our success as a team is if you are able to improve your ball skills and physical conditioning on your own, prior to the start of our season; then we as a team will be able to do more during practice to prepare for our matches during the season. How effective can you be on the field? This will determine how much you actually get to be on the field. Everyone wants to be a champion once the season begins when in reality you have to want to be a champion BEFORE the season begins. CHAMPIONS are built in the off season! Championships are not won; they are earned through hard work and effort. Of the distance commonly traveled in a typical soccer game (5.5-6.8 miles), 2.4 mi are spent jogging, 1.2 miles are used running at a high but not maximum speed, 0.6 mi are spent sprinting at max speed, 1.5 mi walking, and 0.3 mi are spent moving backwards. In this packet I have outlined a series of exercises to work on your aerobic conditioning (endurance running), anaerobic conditioning (muscle speed and power), agility, strength, technical skills, and diet. All of these factors are critical to your preseason conditioning and will directly affect your ability to play the game and the amount of time you spend on the field. If you want to compete for a championship this year, it is the obligation (to you, to me, and to your teammates) of each potential member of the Horseheads Varsity Boys Soccer Team to properly prepare yourself before the season begins on Monday, August 13th. Ideally you should be training at least 3 days per week during the off season and, if possible, getting touches on a ball every day (15 minutes). It only takes 30 minutes to get in a good endurance run and set of sprints. No matter how busy you are, everyone can find at least 30 minutes to train; you just have to have the right mindset. The best time to train is in the morning before you start your day and before you can find 'excuses' as to why you did not have the 'time' to work out. A full workout may take upwards of 90 minutes if you include endurance training, agility, strength training, and ball skills. On days when you have the energy, work out in the morning and evening, but never for longer than 90 minutes for each workout. Get to a field and work on specific skills with a ball such as shooting, chips, crosses, etc. Think about the skills that will be required of you at the position you plan to play. As the old saying goes, "You get out of something, what you put into it." How much will you put into your off season training? This will truly determine how much we get out of you during the season. Half the effort gets you half the results. This season I am looking to keep 18 players, and I am looking for 11 standouts to be our core group of starting players who earn the right to see the majority of the playing time. Tryouts will begin on August 13th, 2018 at 8:00. In order to play this game you must be able to move up and down the field as a unit. This means that you must be in proper condition to do this. A chain is only as strong as its weakest link - don't be the weak link. Plain and simple - it is expected that during tryouts, as a potential varsity soccer player, you will achieve a MINIMUM of Level 13 (JV 11) on the "Beep Test" on the first day of tryouts. A copy of the Beep Test (MP3) is available on the district's soccer website and can be seen on YouTube. Please remember that each run should be 20 meters (20 yards is acceptable). ACHIEVING LEVEL 13 ON THE "BEEP TEST" DOES NOT GUARANTEE YOU A SPOT ON THE TEAM OR PLAY TIME, it just shows that you put some effort into your preparation for the season. While preseason conditioning is very important to our sport, please remember that you will also be assessed on your technical skills, tactical awareness, decision making, strength, agility, attitude, ability to follow directions, sportsmanship, and showing respect for your teammates and coaches. Please remember that it is a privilege, not a right, to play soccer for this program and to represent your school and your school district. No one person, including myself, is any more important than any other. We are in this together and it takes a TEAM effort to be successful. We must work together through good times and bad, support each other in a positive way, and give everything we have if we hope to accomplish our goals for the season. I promise to work hard and to give my very best each and every day, respect you as individuals, and always do what I feel is best for the TEAM. In return, I expect no less from you. Please remember - Play time is NOT GUARANTEED for players who make the team. The 11 players with the best combination of technical skills, tactical awareness, effort and attitude will see the majority of the play time. Practice for V and JV players will start on Monday August 13th (first day of tryouts) at 8:00 AM. Players who are trying out for either the JV or V teams must attend all tryout sessions. Accommodations will be made for students who are attending summer school or taking regents exam. Evening sessions the first week will run from 6:00 to 8:00 PM Monday thru Friday. You should arrive at least 15 minutes prior to each practice session. This will give you the appropriate amount of time to get ready. All soccer players are to be ready for practice so that we may start promptly at the start times listed above. That means cleats, socks, and guards on and sitting on the bleachers by the flagpole ready to go. DO NOT BE LATE. Please bring multiple pairs of shoes with you to practice (cleats & turfs/flats). Do not come to practice with new cleats if you have not worn them around the yard or house for a couple of days. One of the best ways to get them worn in to reduce the chance of blisters is to wet them and wear them so they mold to your feet. You must have NOCSAE Approved shin guards that are STAMPED for your individual height. For directions to away game sites please visit www.schedulegallaxy.com. The varsity Soccer Schedule will display by default, but can be changed in the upper left of the page. Sometimes in coaching you know what weaknesses your team has, but you don't know how to set up your practice to address those weaknesses. I have been coaching soccer since 1995 and have done the best I could to write down and diagram all of the drills that I have used successfully in practice. Some drills I have designed myself and many have come from coaching magazines and/or other coaches. My hope is that in some way, shape, or form this document can be used to help you better coach your teams weaknesses. Feel free to copy any or all of the drills above and use them. All that I ask is that if you find one or more drills in this packet that has helped you, return the favor. E-mail me a drill not in this packet that you have used successfully to improve your teams play. I will do my best to continue to update this list to make it as extensive as possible as I get skills and drills from you. Not one of us as a coach can be successful by ourselves. We need our peers to help us to be a lifelong learner in the game of soccer. Best of luck and have fun teaching your kids how to enjoy the game of soccer! Click here to go to our skills and drills page with 80 different drills available for download. Plain and simple - it is expected that during tryouts, as a potential varsity soccer player, you will achieve a MINIMUM of Level 13 on the "Beep Test". A copy of the Beep Test (MP3) is available here (right click and choose "save as" to download the file). It takes approximately 12 minutes to reach Level 13 on the Beep Test. Another great aerobic conditioning exercise is the 15-30-15 run. Three cycles are performed consecutively with a 20 second break between each rep and a 2 minute break between each cycle. You should be running at 85%-95% of your maximum potential. Start cycle one by running 15 yards. Do not start decelerating until you have run the full distance. Stop, recover (20 sec), turn and run back 15 yards. This is two reps. Do 12 reps at 15 yards and then increase the distance to 30 yards in cycle two. Do 9 reps at 30 yards and then reduce the distance to 15 yards in cycle three and do 12 reps. The constant starting and stopping improves the ability to accelerate and decelerate, develops leg strength and produces a conditioning effect superior to that developed with distance running. Change your running style occasionally for 4 reps during the 15 yard run. Run backward, run laterally using a crossover step, start with your back turned to the direction you are running, then turn quickly and run. Once you have built up your endurance and can run all the reps at near full speed, double the reps (24-18-24). This one is simple: run hard for 4 minutes at "95% of max heart rate" pace alternating with a 4minute recovery jog at "70% of max heart rate" pace. Rest for 3-4 minutes. Repeat 4 times per workout session, done twice per week. Do 5-6 consecutive 25 yard sprints. Rest 2 minutes. Repeat for 4 total sets. Straight sprints also help improve speed and starting acceleration. You should also do at least one long distance jog per week at about 75-85% effort. Notice there is no suggested distance, just keep running. If you have a bike, go for a long ride preferably with some hilly terrain. Cycling works your muscles slightly different and can add to your endurance and strength. Ideally you should be doing one of these exercises every other day (3 times per week), giving your body a day's rest in between. You do not have to do the same thing, mix it up. The important thing is that you are training on your own long before the season actually begins. Ideally, you should sprint train right after your aerobic conditioning runs. After a short rest of course (Don't let yourself cool down too much). Sprint training should only be done a maximum of 3 times per week with a day's rest between training. Do long and short sprint drills each week. Short sprint drills improve starting explosiveness and muscle strength. Perform sets of six sprints of 30 meters each. Resting for 1 minute after each repetition. Take a 3 minute break between sets - maximum 3 sets. Sprint 60 yards with starts and stops. Sprint 15 yards, stop, sprint another 15 yards and stop. Repeat till you reach the full 60 yards. Take a 1 minute rest and run again. 300's: On a soccer field, start out on the end line and sprint to mid-field up and back 6 times (50 yards x 6 = 300). High school players should try to run these in less than 70 seconds. After each 300, rest for three minutes and then repeat. Hills: Find a steady incline hill (Thorne St.) Sprint up the hill and jog down. The jogging is recovery time, so this can be done slowly. Once players reach the bottom, they should turn around and sprint up the hill again. After five (5) hills, then take a two minutes rest and do five (5) more. 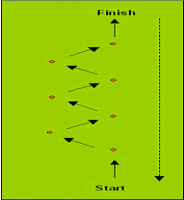 Cones: These are sprints. Place cones about five (5) yards apart for 25 yards. 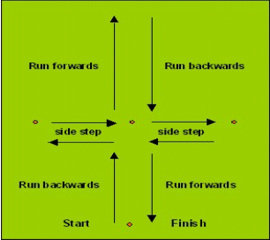 Players should sprint to the first cone and then back to the start, then sprint to the second cone and then back to the start, and so on. Five cones up and back is one repetition. Do ten (10) reps and then a one (1) minute rest. Then ten (10) more. 30-30's: Warm up by jogging for a few minutes. Next, alternate 30 seconds of jogging with 30 seconds of sprinting. Do a set of five (5) 30-30's, then rest two (2) minutes and then five (5) more. 120's: This is a full sprint of the length of the soccer field. High school players should try to do this in less than 20 seconds. 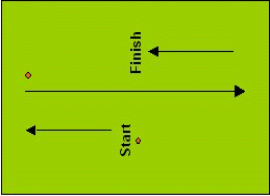 After reaching the opposite end line, players should jog back, allowing 60 seconds to recover. Do 7-10 of these. fifteen to cool down and stretch to conclude fitness training. Agility training improves your balance, body control, foot speed, coordination, and quickness. A typical agility session could consist of 3-5 sets of 10 repetitions in total (a repetition being one complete drill). Below are listed several examples. Alternate the ones you choose to do. The emphasis is on taking quick side steps, rather than turning to face the marker and sprinting forward - that takes more time (which you don't have in a game). Follow the Leader - you will need a partner. Mark out a large area - 20 yards by 20 yards for example. Pair up with a teammate and have them run randomly within the area. Box Drill - you will need a partner. Give each corner a number and remember it! Have a team mate call numbers at random. Set a series of cones out in a cross formation. (see diagram right). Allow 7 to 10 yards between the cones. Start by running backwards to the center cone, side step to the cone on your right, side step back to the center cone still facing the same way. At the center cone turn and sprint forward to the end cone. Now run backward to the center cone, side step to the outside cone, side step back to the center, then turn and sprint back to the start. REPEAT. Place 10 cones in a line 5 yards apart. Place 8 soccer balls 10 yards away from the starting line. The athlete must run 10 yards and dribble the ball back under control and stop it once the start line is crossed. Perform this for all 8 soccer balls as fast as possible. The athlete must work on quick acceleration and change of direction even while fatigued. Be sure to stop the ball from moving once the start line is crossed. The ball cannot be just kicked past the line. *You can do this drill with only one or two soccer balls, just stop the ball on the line, quickly turn and repeat.You can do this drill with only one or two soccer balls, just stop the ball on the line, quickly turn and repeat. Speed and agility on the field relies on three basic elements: "First you have to be explosive and powerful," Friedman says. "Then, you have to be stable enough through your ankles, hips and torso to be able to deliver that power efficiently into the ground. And finally, you have to deliver the power into the ground in the right direction, and that's where technique comes in." Friedman's program consists of two separate workouts, one focusing on linear speed and one on multidirectional speed. Each workout is divided into three sections: movement preparation, plyometrics and movement skills. Friedman suggests alternating between Workout 1 and Workout 2, doing each on different days. If you do not know how to do something, there are videos on YouTube or ask me. Strength training for soccer benefits performance and also helps injury prevention. Imagine a box on the ground and always facing the same direction, jump your way around it for 30 seconds. Then reverse the directions and jump for another 30 seconds. Rest 1 minute and complete 2 more sets of the above. Power skip 20 yards for 5 consecutive minutes. Explode upward trying to achieve your maximum height. This will help with getting to balls in the air. Ball Jump - jump over your ball or another suitable object. As you get better, pick a slightly taller object. Forward/Backward for 30 seconds. Do 3 sets. Side to Side for 30 seconds. Do 3 sets. Diagonal (hour glass) for 30 seconds. Do 3 sets. Standing on only one foot, jump forward, then backward, then side to side for 30 seconds (Plus sign +). Switch feet and repeat. Do 3 sets. Step Ups - 2 sets of 5 minutes each. Use a stable object 12 to 16 inches high. Lunges - 5 minutes. Go 20 yards, turn and come back. Squats - 5 minutes. Stand upright with your arms straight out in front of you and then, keeping your back straight, squat down is if sitting in a chair and rise back up. The following exercises are also beneficial to the soccer player. The players should workout with 50% to 75% of their maximum lift for one repetition (MR) and no more than ten repetitions should be done. FIND A WALL. Hitting a ball against a wall can help your passing or shooting technique. Trapping the ball off the rebound can help with ball control. EVERYONE needs to be able to make a decent cross!! Get out and practice! Repeated kicking of long balls improves leg strength and accuracy - Practice with a partner. Soccer players need energy, which is most commonly found in carbohydrate. This should account for nearly 70% of a soccer player's diet, which many fail to realize. Eat high-carbohydrate meals the day and night before a match to fuel your muscles. These meals should consist of two-thirds carbohydrate (bread, bagels, pasta, rice, tortillas, potatoes, cereal, fruits, juices, vegetables, yogurt and milk) and one-third protein (lean red meats, poultry, fish, shellfish, eggs, milk, cheese, soy products, beans, nuts/nut butters and seeds). Fried or fatty foods will not fuel your muscles or enhance performance. Make sure you are drinking water, juices and sports drinks throughout the day to stay hydrated. Breakfast refuels your body to replace the energy it used while you slept. It also helps you think better. Once again, the breakfast should be high in carbohydrates and low in fat, with a small amount of protein (depending on tolerance and time of event). If your event is 2-3 hours or more after breakfast, this should be a substantial breakfast. What if I'm too nervous to eat? Studies have shown that getting something into your system can improve performance. Anxiety can affect gastric emptying and cause stomach distress, so choose foods that are liquid or semi-liquid. Examples: yogurt, honey, applesauce, banana, pudding, sports drink, carbohydrate gel or liquid supplement (chilled if possible). Nutrition conditioning-i.e. training your gut by eating the same meals and snacks in training that will be used in competition-can also be helpful. What if my event is early in the morning? Have your breakfast (e.g. bowl of cereal) as a late-night snack the night before. The day of your event, wake up and drink 8-16 ounces of sports drink, try a packet of carbohydrate gel washed down with water, or drink a glass of juice. Aim for 100 calories. Give your body carbohydrates to maximize blood sugar and glycogen stores, get rid of hunger feelings and help you think clearly. The challenge is deciding what foods you can tolerate and when. Foods should be high in carbohydrates, low in fat and low in fiber, with a moderate amount of protein. To restore muscle glycogen, repair muscle damage and replace fluid and electrolytes, athletes should refuel and rehydrate within 30 minutes after the event. This 30-minute window of opportunity helps to maximize recovery, enabling players to bounce back for future training and events. Fluids: Replace 24 ounces for every 16 ounces lost during the event. Including sodium in the recovery plan is beneficial. Examples: sports drink, recovery drink, meal-replacement drink or chocolate milk. Carbohydrates: Eat half a gram per pound of body weight. Protein: Aim for 10-20 grams of protein. What if I don't feel like eating right after my event? Focus on liquids. Lowfat chocolate milk is a great replacement drink for the crucial 30-minute time frame! Are fluids really that important? Yes! Being only slightly dehydrated can decrease strength, speed, stamina, energy and cognitive processes while increasing the risk of injury. Drink 16 ounces of sports drink two hours before the event (urine should be light-colored but not clear). Drink 8-16 ounces of sports drink 15 minutes before the event. Drink as often as possible. Drink 16-24 ounces of sports drink. Wayne Rooney and Cristiano Ronaldo worked well together at Manchester United and became great friends, and still are. However, as we all know, things got ugly between them at the 2006 FIFA World Cup in Germany, when England played Portugal in the quarter final. This is a great example of how the right mentality and 'mental success' can lead to actual success on the pitch. In that match, Wayne Rooney was sent off after he lashed out on Portugal and Chelsea defender Ricardo Carvalho as both were tussling for the ball. He couldn't control his emotions, and let his team (and nation) down by getting on the wrong side of referee Horacio Elizondo and being sent off. Putting aside Ronaldo's actions in helping get Rooney sent-off (and the infamous wink), there were occasions in the match where things were getting desperate for Portugal as well as England, and Ronaldo had similar tussles for the ball like Rooney had with Carvalho. Did Ronaldo lose control of his emotions during matchplay and lash out at the opponent in frustration? No, he didn't of course, and his side went onto win, albeit via a penalty shoot-out. For no moment in that match did Cristiano Ronaldo forget about that winning mentality (i.e. wanting to win). And for no moment did he respond to mistakes, like Wayne Rooney did, by getting angry and subsequently trying too hard. Instead, the former United winger took a relaxed, problem solving approach, despite the incredibly high pressure situation, meaning his game behaviours were more solution orientated. And thus Portugal went onto win, and progressed through to the semi finals. One final example of sports psychology at its finest in football would be the case of AC Milan midfielder David Beckham, and the psychological re-programming done to him in his trophy-laden Manchester United days. Manager Sir Alex Ferguson brought in a sports psychologist ahead of their unprecedented season of Premier League, FA Cup, and UEFA Champions League successes. Bill Beswick was his name. He worked at Derby County as well, and also the England national team, albeit in the dire Steve MacLaren era. However, it was indeed Beswick who built that famous 1999 winning mentality in the Manchester United squad. He once told the United players a parable about three bricklayers who were each asked what they were doing. The first said "laying bricks", the second "earning £10 an hour", but the final brick layer replied "helping to build a beautiful cathedral where I can bring my kids". In the training match that followed, Beckham netted an exquisite goal and reputedly looked to Beswick and said, "Cathedral 1 Bricklayers 0." Before of course going on to claim that unprecedented famous hat-trick of major titles with his club...the treble. That is just another fine example of how 'mental success' separates the best from the rest. Cristiano Ronaldo, Lionel Messi and Kaka all have that in abundance. Team Records, Individual Records, All-Star Teams, Conference Champions, and a Team History are available below for download in Adobe Acrobat (PDF) format. If you don't have the Adobe Acrobat Reader, you can get it here.